“History has been robbed from your mind. This country is the United Snakes of America.” said James Muhammad as he helped lead a discussion on Black on Black love not being a crime, which he believes is an accusation that was created in this country. 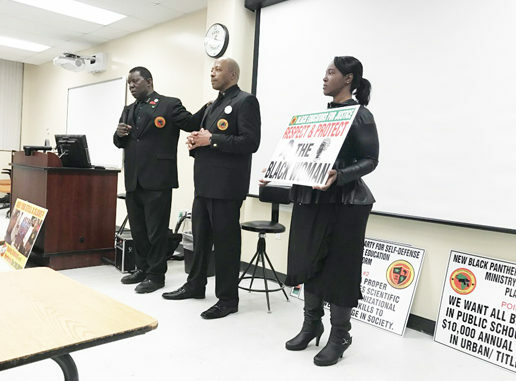 Coordinated by the Pan African Heritage Institute Associate Fellows and the Alpha Kappa Delta Sociology Honor Society at Florida A&M University, representatives of the New Black Panther Party shared some ideas concerning Black love to FAMU students on Feb. 21 in Foster Tanner. New Black Panther Party representatives Minister James Muhammad and Minister Mikhail Muhammad from Jacksonville explained that their organization believes in the promotion of love, security and respect within the Black community. Both emphasized the importance of knowing Black history and being educated through literature. James, the minister of education, blatantly vocalized the need for Black people to love each other unconditionally, mentally, physically and spiritually. The need for unity in the Black community is constantly challenged when people deviate to using anger as a form of expression. The Black woman has been taught to hate the Black man, and the Black man has been taught to not touch the Black woman,” James said. The NBPP strives to teach the youth how to properly mate with one another and respect the Black woman. 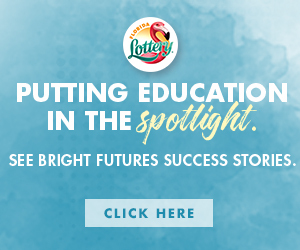 The organization is a safe haven for Black brothers and sisters to learn about themselves and enhance their individuality by joining and becoming an active affiliate in the local chapter. “We come out of love, we do not create hate groups, we create love group.” Mikhail said. Mikhail, a minister of self-defense, spoke on men treating Black woman with the respect for their internal significance and not physicality. He advocated for Black men to acknowledge Black woman, building with her to expound upon Black excellence. Jeremy Strife, the NBPP affiliate of the Tallahassee chapter, reflected on the agony Black women have suffered in society. According to Strife, the most slandered, raped, abused and culturally misappropriated group of people are Black women even though all the men alluding to this. “In light of Africa, the Black woman is the strongest being on the planet,” Strife said. “They endure the most pain than any other human being. Every person that has a belly button, you come from a woman. The men need to step up and respect the Black woman or else how can we strengthen each other.” Strife spoke highly on Black men treating women with respect leading the crowd of students to the understanding that, “If you do not respect her, you cannot protect her.” The NBPP strives to reach out to FAMU students more often to bring awareness and unity amongst the student body. “We love you, you are the future,” James said. Shown l-r are balck panther party Representatives Ministers James Muhammad, Mikal Muhammad and Renee X.